Sabrina Strings, Ph.D. has always wanted to write. As a young girl, her parents gifted her a little desk so that she might have a proper place to sketch out the tiny imaginative stories she passed to them when the inspiration struck. Today, Sabrina is constantly seeking ways to combine her love of writing, her passion for yoga, and her devotion to teaching and community service. As a yoga teacher, she offers free and dana-based yoga classes and workshops in low-income, POC-dominant communities like Oakland, Richmond, and East Los Angeles. 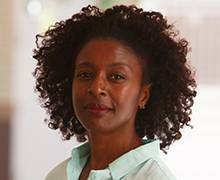 She the co-founding editor of the first-ever publication dedicated to interrogating the link between race, gender and the modern practice of yoga, Race and Yoga Journal. As a professor, she travels the world giving talks on race, yoga, and women's history. She teaches courses on feminist theory, social inequality/collective liberation, race/gender and embodiment, and food justice. She is on the Community Resilience Project Faculty Advisory Board, where she helps to organize and promote local actions for environmental and climate justice. As a writer, her social commentary has been featured in The Feminist Wire, Truth-Out Independent News, and Yoga International. Her writings on the nexus of fatness and blackness can be found in Fat Studies, Signs: Journal of Women in Culture and Society, and the Oxford Handbook of Body and Embodiment. Her new book, Fearing the Black Body: The Racial Origins of Fat Phobia (NYU Press 2019) explores how the phobia about fatness has been historically related to fears of racial integration.